In 25 years of representing Defendants accused of committing domestic violence crimes in the Norwalk Courthouse a lot has changed in this area of the law. Ask any top Norwalk domestic violence defense lawyer and they will agree that domestic violence crime is an area in which the Judicial Branch is investing a lot of resources and money and in our society violence within the family unit is steadily on the rise. Technology such as text messages, and social media have made it easier for stalkers to track victims and communicate threats but it is also easier for the Police to document cases of domestic violence as often there is an electronic trail of evidence of the crime. One thing remains constant is the devastating effect that a domestic violence arrest can have upon your life often from one moment to the next and without much warning. A neighbor over hears a loud argument, someone picks up a phone and calls 911 and a few minutes later Police are at your house arresting everyone involved and issuing orders that you have to leave your home for the night. Then you have to appear in Court the next day for a mandatory arraignment with little time to locate a Norwalk domestic violence defense attorney. Often clients appear at Court the next morning without any lawyer having spent a sleepless night filled with worries and stress. Over the last 20 years the Legislature has been constantly working on the domestic violence laws and making them progressively stricter and expanding their reach into more and more areas of life. Under our laws the Police are required to make an arrest if they find any evidence that a crime was committed even if the victim does not want to press charges. This is known as “mandatory arrest.” Defend your liberty and be informed of your legal rights by contacting a top Norwalk domestic violence defense attorney today. At the Law Offices of Allan F. Friedman we understand that you are facing a difficult situation, undergoing a lot of family stress and uncertainly about what you face in the criminal justice system. Call us today at 203.515.4110 for a free initial consultation. What Is a Domestic Violence Case? The Legislature really takes domestic violence also known as “family violence” very seriously and has been hard at work creating an huge bureaucracy to deal specifically with these types of crimes. As a result a significant amount of funding has been allocated towards the creation of specialized domestic violence courts and a lot of resources are being spent on sending offenders into domestic violence treatment programs. In addition there are family violence intervention units at each Court and victim’s advocates all of which are designed to work to curb domestic violence. Despite these efforts the rates of domestic violence arrests in the Norwalk area are higher than ever and the Court’s dockets are filled with domestic violence cases. Due to the fact that some instances of domestic violence lead to serious injury and even death these cases are taken very seriously by Connecticut Courts. If the relationship between the victim and the accused fits within one of the above mentioned categories than any violent crimes involving for example threats, an assault or a violent act or stalking behavior would be a classified as a “domestic violence crime.” It is interesting to note that in fact there is no such thing as the crime of “domestic violence” itself in Connecticut. This is a point that mixes up a lot of people. What happens is that you get charged with the particular crime that you have been alleged to have committed, for example assault, and because the accused and the victim’s relationship falls within the statutory definition of “family members” then the assault is handled as a “domestic violence” assault. If the same assault took place but the parties did not fall with the above listed family categories then it would not be a domestic violence assault. When a crime is handled as a domestic violence matter it means that procedurally it must be resolved on the domestic violence docket of the Court and that the statutes related to domestic violence must be applied to the prosecution of that case and the protections afforded domestic violence victims must be imposed. Accordingly if you are charged with a domestic violence offense it is advisable to retain a domestic violence defense attorney serving Norwalk who has experience dealing with the procedural nuances of domestic violence matters as they are handled differently than traditional criminal cases. When you are facing a domestic violence crime you have to face the exposure to the criminal sanctions that go along with the particular crime you were alleged to have committed but in addition you also have to face all the domestic violence procedural steps, protocols and consequences which are a result of the case being classified as a domestic violence crime. When your case is handled as a domestic violence case it will take longer to get it resolved, usually there are going to be orders of protection issued which protect the victim and in many cases there are Court ordered conditions of release such as referrals to AIC for anger management and substance abuse treatment and counseling. If the Police have been called to or alerted about a possible domestic violence crime they are required by statute to make an arrest if they find probable cause that a crime has taken place. It does not matter if the victim has no desire to “press” charges. In many domestic violence situations third parties will call in reports of domestic violence attacks or arguments taking place in public places. Very often the victims will not want to cooperate with police and do not want the abuser arrested. If the Police are able to determine that a crime was committed, for example through the statements of an eye witness or by the use of surveillance video, it does not matter what the position of the victim is. Also, in many situations the victim many actually have called 911 for assistance but by time Police arrive may have reconciled with the abuser or calmed down. Again, if Police find evidence of a crime, e.g. scratch marks, bruises, etc. they are mandated to make an arrest by law. This is what is referred to as the “mandatory arrest” law. In many situations victims will later contact the State’s Attorney and ask them to drop the charges. This will have no effect on the State’s decision to prosecute the case. It is quite common for domestic violence victims to later reconcile with the alleged abuser and request that the charges be dropped. A lot of people are under the misconception that having the victim contact the State’s Attorney can lead to the State dropping the case. This is a misnomer. While the State will certainly consider the victim’s input in making a decision how to dispose of any particular case, the victim is not in charge of the decision to prosecute the case. Connecticut is one of the few states with a “mandatory arrest” statute that does not have a so called “primary aggressor” statute. This means that in many situations in Connecticut involving domestic violence arrests the Police will simply arrest everyone involved in a domestic violence dispute and leave it up to the Courts to determine who is responsible. This leads to the undesired result of victims of domestic violence who call 911 for help finding themselves being arrested along with the abuser who they were calling the Police to protect them from. This is known as the so called “dual arrest.” According to arrest statistics in some Connecticut towns the rate of dual arrests is as high as 35% in domestic violence cases. It is regrettable that in so many situations the victims of domestic violence who are seeking help will find themselves dealing with the added complication of fighting a criminal case and having to come to Court. If you have been arrested for a domestic violence crime it is important to act quickly to get in touch with an experienced domestic violence Attorney serving Norwalk to defend your interests before the Court takes possible action to either impose a restrictive order of protection which could prevent you from returning to your own home or orders onerous conditions of release. 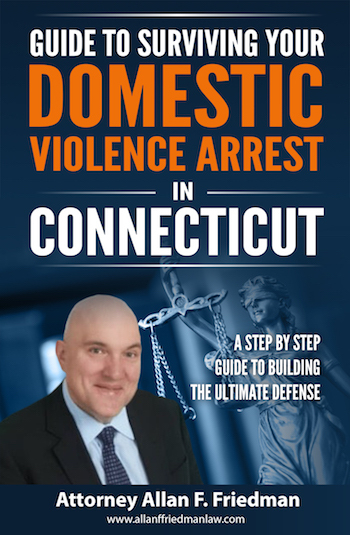 Connecticut law requires that anyone who is arrested for a domestic violence case must appear in Court the next business day for a domestic violence arraignment. Whether you are in Police custody being held on bond, already have posted bond or have been issued a conditional promise to appear by the Police you will be required to be presented before a Judge of the Superior Court on the very next business day for a formal arraignment in which the Court will address some very compelling matters which will effect your life for the upcoming months as the case proceeds. For this reason it is very important if you can to reach out and retain a domestic violence defense lawyer servicing Norwalk so you will have an experienced attorney there to protect your interests and rights during the arraignment. In reality due to the very limited time afforded many people do not have the time to retain an attorney and appear without one. In many cases they will wish that they did have a lawyer after the Court issues restrictive orders of protection and onerous conditions of release. In many cases our office needs to file motions to correct and modify orders which were entered during an arraignment in which a client went in without an attorney and wound up with a set of very restrictive orders. After you arrive at the Norwalk Court shortly after the advisement of rights the State’s Attorney will call out a list of names of domestic violence arraignment cases and ask that you step out of the Court and go meet with family relations. This procedure is slightly different than in Stamford where you should proceed directly to the third floor and sign in with family relations. The Norwalk Court has a great team of family relations officers with many years of experience in domestic violence matters and they are very professional. They are there to assess you and screen you to determine the level of danger that you pose to the victim. While it is important that you remain cooperative, professional and friendly it is not a good idea to get into talking about any specific details of the allegations of the crime itself. Remember anything that you say in this interview can and will be used against you. You have the absolute right to not discuss the details of any criminal allegations. Of course your best plan would be to retain a Norwalk domestic violence defense attorney to be there with you and help deflect any questions which touch upon the issue of criminal culpability. The main impression you want to make is that of a well-balanced, reasonable, rational and stable person. After evaluation of the allegations contained in the Police report, and the discussions with you and the victim (if the victim choses to attend Court), then the family relations office will be making suggestions to the Judge about what kind of criminal orders of protection should be issued in the case and also what kind of referrals for treatment or evaluations should be conducted during the pendency of the case. 99% of the time the Court is going to follow the recommendations of the office of family relations to the letter. That is why it is so important that your meeting with family relations goes smoothly and why it is always recommended that you retain an experienced Norwalk domestic violence defense lawyer to represent you during domestic violence arraignments. In virtually every domestic violence case the Court is going to issue some form of criminal order of protection in favor of the victim. As suggested in the proceeding section in most scenarios the Court is simply going to go along with the recommendations of the family relations office and usually the criminal order of protection forms have already been drafted in advance by the family relations officer for the Judge’s signature. What follows is a proceeding in which the Judge questions you to determine if you recognize the initials of the protected party (whose name will not be read aloud in Court) and then explain to you the terms of the criminal order of protection. There are three different levels of criminal orders of protection which can be imposed during a domestic violence arraignment. The entry level or base order which is the least restrictive is known as the “partial” criminal protective order which prohibits you from annoying, harassing or assaulting the victim during the pendency of the case. The next most restrictive criminal order of protection is the midlevel order and is known as the “full” order which is some people refer to as the “residential stay away order” this order prohibits you from entering the residence of the victim and also you must obey the limitations of the “partial” order. This means that even if you own the home, even if you pay the rent, you have to vacate the family home during the pendency of the case or until the order if modified by the Court which can take a significant period of time. Of course having to suddenly and unexpectedly vacate your home overnight and find a new place to live can not only be enormously stressful but it can also be a very costly proposition if you have to suddenly reside in a hotel or find a new place to reside. The most restrictive and severe criminal order of protection is known as the “full no contact” order means exactly what it says, you can literally have no contact with the victim at all. In some cases the Court will also extend the order to prevent you from coming within 100 yards of the victim. Where there are minor children involved and visitation arrangements need to be coordinated often the Court will provide a means for some form of text communication between the parties to coordinate visitation arrangements. It should be noted that any violation no matter how slight or “technical” of a criminal order of protection is a felony punishable by up to 10 years in prison. The victim can’t authorize you to modify a criminal order of protection or initiate contact. Only a Court can modify a criminal order of protection. It can be somewhat shocking and overwhelming for many first time domestic violence offenders many of whom may be facing their first encounter with the criminal justice system to suddenly come face to face with such heavy handed and life changing criminal orders of protection. In some situations these orders are the result of what started as what would have seemed at the time as a minor verbal disagreement. If you are facing this situation it is time to get an experienced Norwalk domestic violence defense attorney in your corner. It is very common in domestic violence cases that the Court will refer Defendants for some form of anger management or substance abuse evaluation and treatment while their case is pending. Statistical investigation has shown that these kind of educational interventions which address the root causes of domestic violence issues are vastly more effective than incarceration or handing out criminal records at preventing future incidents of domestic violence. As a consequence of the research in the field of domestic violence and encouraging statistics on the reduction in recidivism which have occurred as a result of these kinds of treatment programs the Court system is investing heavily in treatment and educational programs for domestic violence offenders. The data has shown conclusively that these forms of treatment programs are the most efficient and cost effective manner in which to address the root causes of domestic violence and in that manner break the cycle of domestic violence by educating offenders about ways in which to avoid domestic violence by avoiding conflicts and this has stemmed the flow of revolving door arrests. For these reasons the Courts are planning a high priority on treatment programs for all domestic violence offenders. In most cases the programs utilized by the Courts are a 12 week long course which meets bi-weekly, although some locations do vary. The providers are all private third party providers. In many examples the courses only meet during business hours. Very often the Norwalk family relations office will recommend some form of condition of release to include either substance abuse evaluation and treatment or anger management with Connecticut Counseling while your case is pending. If the Court adopts these recommendations, which the Judge usually would unless you have a lawyer present to persuade the Court to enter an alternative suggestion, then you have to participate in the course of treatment with Connecticut Counseling as a condition of your release or risk a bond increase. In some instances if you are charged with a minor offense such as breach of the peace or disorderly conduct participation in these type of programs can actually lead to a resolution of the charges against you. However, in many cases the programs only offer these programs during business hours and for many professionals who are employed in demanding careers, especially those who have to commute to New York City or those who travel for work, often participation in one of these programs is just impossible due to scheduling conflicts. In these situations, the preferred way of resolving this situation is by having your Norwalk domestic violence defense attorney file a motion to modify your conditions of release to permit you to engage in the treatment ordered but at a private therapist so you can schedule it when it suits your schedule. Also, in most cases, the treatment with a private therapist will not involve as many sessions as they are one on one sessions and not group meetings. Finally, a huge plus with private therapy is that you can have some insight in advance of what is being submitted to the Court in terms of treatment notes. If you have been arrested for a domestic violence crime it is very important to immediately contact a Norwalk domestic violence lawyer to represent you at your arraignment to advocate to lessen the severity of any criminal orders of protection which the Court may issue against you and also stand ready to push back against any overly burdensome conditions of release which the Court may order. We have a 24/7 emergency response phone and chat team to respond to domestic violence arrests. Our fee to represent you at a domestic violence arraignment is a flat fee of $350. (Note- this fee is for your arraignment only. Legal fees for the full case will vary depending on the degree and severity of the charges against you and your previous criminal record if any. We provide a free initial consultation and fee quotation). The best plan would be to contact a Norwalk domestic violence attorney to represent you at your arraignment. So many important decisions are made at the arraignment which will have a profound impact upon your life and family it is crucial to go in well prepared and with an experienced lawyer to guide you. Because of the short time span between the time of the arrest and the arraignment in practice many people do not have the time to hire a lawyer and are self-represented at their arraignment. If you are one of those who has already been arraigned without an attorney present do not worry your case is just in the beginning phases and you should contact the Law Offices of Allan F. Friedman for a free initial case evaluation to discuss the possibility to review and modify your criminal orders of protection and conditions of release but also work on a strategy to resolve your entire case. Although domestic violence matters do have some difficult procedural steps and generally take longer than normal criminal cases to resolve the positive news is that generally we can obtain a favorable resolution which in most cases leads to a complete dismissal of all criminal charges and you will have no criminal record. If you are charged with a domestic violence offense you should retain an attorney who frequently handles domestic violence matters as the effective resolution of domestic violence cases require a unique procedural and strategic approach. There are several different avenues which lead to having your domestic violence charges dismissed. Of course in every case our primary objective, if at all possible, is to avoid any criminal record of any kind. In less serious cases such as breach of the peace and disorderly conduct where there are no allegations of physical injuries, simply completing the Court ordered anger management or substance abuse treatment successfully may be enough to convince the State’s Attorney to drop or “nolle” the charges. In other situations some work with the office of the victim’s advocate may be needed to get the victim on board with a proposed disposition which involves the dismissal of charges against you. For clients who are facing more serious allegations or in situations where the victim is insistent upon prosecution the next level would be a diversionary program known as the Family Violence Education Program which consists of an educational component and would lead to the dismissal of all charges against you. For more serious cases involving serious allegations or multiple incidents with the same victim there are more intensive versions of the Family Violence Education Program which have extended periods of classes lasting either 26 or 52 weeks. Also, the accelerated rehabilitation program is an option for certain charges such as risk of injury to a minor which do not qualify for the Family Violence Education Program. Having an experienced Norwalk domestic violence lawyer who has experience working with all these various programs and alternative case dispositions can make a significant difference in the outcome of your case. Some domestic violence cases are a lot more complicated to resolve. For example, clients who have a criminal history of convictions for domestic violence crimes are not eligible for any diversionary program and the State’s Attorney is going to handle those cases much more seriously. In addition we represent many clients who have violated the terms of a criminal order of protection while their domestic violence cases were pending, (sometimes several times), which makes the resolution of the case much more challenging. The Courts and State’s Attorneys take the violation of any criminal order of protection very seriously. Finally in some instances we have clients who have had the misfortune to accumulate several cases pending at the same time against the same victim. These cases always require additional attention and strategy to plan a resolution that achieves an optimal result for the client. In these type of situations we work to demonstrate to the Judge areas of mitigation and good points about our client’s personal life, work history, educational background, family life, civic and charitable contributions and efforts made towards rehabilitation while the case is pending. The goal in these situations is to always work out a resolution that avoids any jail time. In the past we have used a tool known as a “conditional plea” to resolve these complex cases with great success. When you contact us for your free consultation be sure and inquire about conditional pleas and how they may aide the resolution of your complex domestic violence case. The best method to achieve the optimal resolution in any domestic violence case depends of the specific facts of the case itself. With over 25 years of experience in defending Norwalk domestic violence cases Attorney Allan F. Friedman will leave no stone unturned to protect your rights and obtain the best possible outcome.